Top to right: San Jose Obon Festival; Nijiya Market; Japantown Insignia, the intersection of Jackson and N. 5th st.; San Jose Betsuin Temple. Japantown (also known as Nihonmachi (ja: 日本町) or J Town) is a historic residential, commercial, and cultural district of San Jose, California, north of Downtown San Jose. Historically a center for San Jose's Japanese American and Chinese American communities, San Jose's Japantown is one of only three Japantowns that still exist in the United States, alongside San Francisco's Japantown and Los Angeles's Little Tokyo. San Jose Betsuin Buddhist Temple. Japantown originally formed as a site for boardinghouses for Japanese men, just west of the 1887 "Heinlenville" Chinatown settlement, which was the block bounded by Sixth, Seventh, Taylor, and Jackson Streets. Initially the residents of Japantown were mostly male, attracted by farming or general labor jobs. In the early 20th century, more women began to arrive as picture brides. As families began, local businesses were started to serve everyday needs for food and clothing. The local Japantown Asahi baseball club improbably defeated the visiting Tokyo Giants in 1935. By 1941, there were 53 businesses in Japantown. During World War II, the Japanese American population was forcibly removed from Japantown and unjustly incarcerated in camps. On their return after the war, many resettled in the area. The upward mobility of the children and grandchildren of the original immigrants to San Jose, along with the expansion and growth of Silicon Valley caused many Japanese-Americans to leave the area for the suburbs, but the culture and vitality of this community remains in the businesses and festivals serving locals and tourists. Japantown is designated as an authentic ethnic neighborhood and is home to many traditional Japanese restaurants as well. The California State Legislature designated this area as one of the last three remaining historical Japantowns in the United States. In 2004, nearly 227,000 people resided within a 3-mile (4.8 km) radius of Japantown, of which 25% were of Asian descent. San Jose Taiko, Shuei-do Manju Shop, whose manjū were specifically requested during the 1994 visit of the Emperor of Japan; Nichi Bei Bussan, founded in San Francisco in 1902 by the father of prominent local businessman Dave Tatsuno and relocated to San Jose after Tatsunos were interned, transformed from a general merchant to an Asian goods gift shop; hand-made tofu at Fuji Fresh Tofu; and a variety of restaurants, professional services, community organizations (for example Yu-Ai Kai Senior Center, and the Japanese American Citizens League) and small retail shops. Two churches founded by Japanese over 100 years ago, Wesley United Methodist Church and San Jose Buddhist Church Betsuin, thrive on the same street, Fifth Street. They are home to many of the local community organizations including active Girl and Boy Scout organizations, and host several of Japantown's largest cultural festivals. Japantown's Fifth Street now also leads to the new San Jose City Hall. Indeed, the Fifth and Jackson Landmark was designed to be seen from City Hall as a beacon and reminder of the people that have helped to build the city. The Fifth and Jackson Landmark is part of a larger California Japantown Landmarks Project to create powerful and emotional permanent outdoor exhibits, including monuments in San Francisco and Los Angeles. Japantown is also home to a number of non-Japanese businesses, including Mexican, Hawaiian and Korean restaurants. Until its closure in February 2019, Wing's Chinese Restaurant was San Jose's oldest continuously operating restaurant. A number of organizations, including the Japantown Neighborhood Association, have joined together to form the Japantown Community Congress of San Jose, which is a community partner to the City of San Jose (represented by the San Jose Redevelopment Agency) that looks after cultural preservation of the area (begun with CA SB 307). Major festivals include Obon (every July), Nikkei Matsuri (every spring) and Aki Matsuri (every fall) and a newer festival, The Spirit of Japantown Festival (also in the fall). In addition there are events that are open to the public at Art Object Gallery and various street venues, including a year-round Certified Farmers Market run by the Japantown Business Association. ^ a b c d e Herhold, Scott (11 February 2015). "New book explores San Jose's Japantown". San Jose Mercury News. Retrieved 9 February 2017. ^ a b c d e f g h i j Domrose, Cathryn (16 June 2000). "Japantown Thrives in Culturally Diverse San Jose / Obon Festival is a summer highlight". San Francisco Chronicle. Retrieved 10 February 2017. ^ a b Fernandez, Lisa (October 15, 2010). "Japanese American Museum of San Jose opens this weekend". San Jose Mercury News. Retrieved July 6, 2014. (d) For example, prior to World War II, more than 40 historical and geographic Japanese-American communities flourished throughout the United States. Sadly, today only three remain, all in California: San Francisco, San Jose, and Los Angeles. ^ a b "Featured Restaurants". Japantown San Jose. 2017. Retrieved 10 February 2017. ^ Vargas, Cherie (25 August 2011). "San Jose's Japantown Brings Japanese Community Together". The Pioneer. Retrieved 9 February 2017. ^ rasteroids (2017). "Nichi Bei Bussan". Nichi Bei Bussan. Retrieved 10 February 2017. ^ Sato, Kristen (22 August 2013). "Nichi Bei Bussan: Cultural gems add a Japanese aesthetic to a home". Nichi Bei Weekly. Retrieved 10 February 2017. ^ "Our History". Wesley United Methodist Church. Retrieved 10 February 2017. Wesley United Methodist Church was established in 1895 by the evangelical spirit and vision of pioneer Issei (first generation Japanese-American) Christians and the struggles and hopes of immigrant families who had come to farm the rich soil of the Santa Clara Valley. [...] In 1913, their sacrifices and labor built the first modest church structure at our present site. ^ "A Short History of the San Jose Buddhist Church Betsuin". San Jose Buddhist Church Betsuin. 2007. Retrieved 10 February 2017. The San Jose Betsuin's colorful origin can be traced to the early Issei pioneers who immigrated around the turn of the Twentieth century. The temple began in August of 1902 when ministers journeyed from San Francisco to San Jose to conduct Buddhist services. Earlier, the San Jose Church was a branch of the San Francisco Church. [...] Our current temple was completed in 1937, and continues to serve our Sangha. ^ "City Hall". City of San Jose. 2017. Retrieved 10 February 2017. City Hall is located at 200 East Santa Clara Street between Fourth and Sixth Streets in downtown San José. [...] Construction began in August 2002 and the doors opened in October 2005. ^ "Los Angeles Japantown Landmark". HCNC. 16 August 2006. Retrieved 9 February 2017. ^ Zavoral, Linda (February 25, 2019). "After 94 years, Wing's Chinese restaurant in San Jose closes". The Mercury News. San Jose, California. Retrieved March 6, 2019. ^ Pizarro, Sal (June 27, 2007). "Update: Japantown festival taking shape". San Jose Mercury News. Retrieved July 6, 2014. ^ "Japantown Famers' Market San Jose". Japantown San Jose. 2017. Retrieved 10 February 2017. Fukuda, Curt; Pearce, Ralph M. (2014). San Jose Japantown: A Journey. San Jose, California: Japanese American Museum of San Jose. ISBN 9780974215709. Retrieved 10 February 2017. 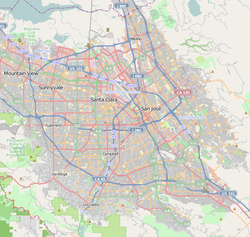 Wikimedia Commons has media related to Japantown, San Jose, California. Arnold, Bruce Makoto. "The Japanese Ethnopole as Determinant: The Effects of the Japantowns on Second-Generation Japanese-Americans." This page was last edited on 6 March 2019, at 16:51 (UTC).